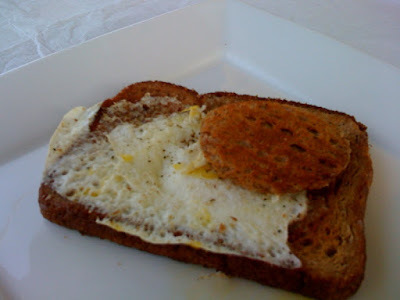 Uncle JR's "Frogs in a Pond"
The center of the toast is cut out - and the egg is fried in it..again with LOTS of butter ! My uncle JR made this while I was visiting him and Janae in Fredericksburg. I'm just saying - a little taste of heaven. Not sure where the name "frogs in a pond" came from.. but hey - it's good bloggin' ! I think it's a pretty simple recipe... so I challenge anyone reading (is there anyone out there) to try and send me their pictures. 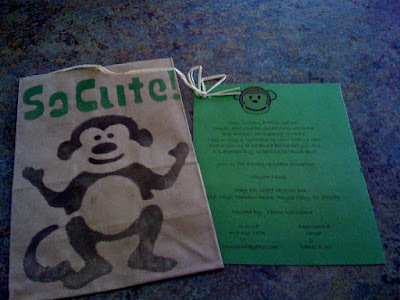 Isn't this the cutest invitation? It's a Baby Sprinkle for my friend, Shyan. Check out this website... fun clothes, home decor, etc. Not sure if I'd buy any of it, but it's fun to look at!